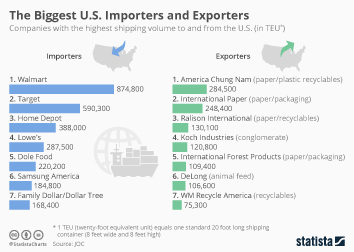 As a massive consumer and a prodigious producer of merchandise, it comes as no surprise that the United States is a major player in international trade. In 2017, the United States ranked as the second largest global merchandise exporter, with a value of about 1.55 trillion U.S. dollars; which was 8.7 percent of total export trade. The United States also ranked as the leading merchandise importing nation in the world that year as well, with a value that amounted to about 2.4 trillion U.S. dollars, or about 13.4 percent of total import trade worldwide. The overall value of both imports and exports to and from the United States has seen a steady increase between 2000 and 2017. One consistent trend in that time period is that there is a trade deficit of goods and a trade surplus of services from the United States. In other words, the United States exports fewer goods than it imports, and exports more services than it imports. The U.S. trade deficit was most prominent between 2005 and 2008 when it hovered between about 700 and 750 billion U.S. dollars per year, and amounted to about 620 billion U.S. dollars as of 2018. Although many manufactured products are imported to the United States, the United States exports a greater value of agricultural products than it imports. In 2018, the United States imported about 539.5 billion dollars of goods from China, making China the biggest importer to the United States. Canada takes first place as the top export partner to the United States, importing nearly 300 billion U.S. dollars of American goods in that year. California is home to the largest domestic economy in the United States, producing a significant share of the country’s crops as well as intellectual property. As a result, California is one of the top importers and exporters of international goods in the United States. In July of 2018 California's import value of goods was about 36.84 billion U.S. dollars. Texas has also seen a sharp increase in both imports and exports in 2018 compared to the previous year. Trade surplus of services from the U.S.